The artificial build-up of beaches is buffering the U.S. Atlantic coastline against the effects of sea level rise, but that benefit may not last as sand gets harder to come by in the coming decades. To analyze patterns of shoreline change along the Atlantic Coast, researchers used U.S. Geological Survey records from 1830 to 2007 along more than 2,500 kilometers (1,553 miles) of shoreline, from Massachusetts to South Florida. The study's authors were surprised to find a stark contrast between historical and recent rates of shoreline change. The authors expected to see a broad pattern of intensified erosion. Instead, they saw the opposite. Their results indicate that after 1960, shoreline position tended to shift seaward at an average rate of 5 centimeters (2 inches) per year. "The weird thing was that in these long-term records, we would have expected to see a lot more erosion than we're seeing. The question was why," said Eli Lazarus, a lecturer in geomorphology at the University of Southampton in the U.K. and one of the authors of a new study published in Earth's Future, a journal of the American Geophysical Union. The authors turned to a database of beach nourishment projects maintained by the Program for the Study of Developed Shorelines at Western Carolina University. 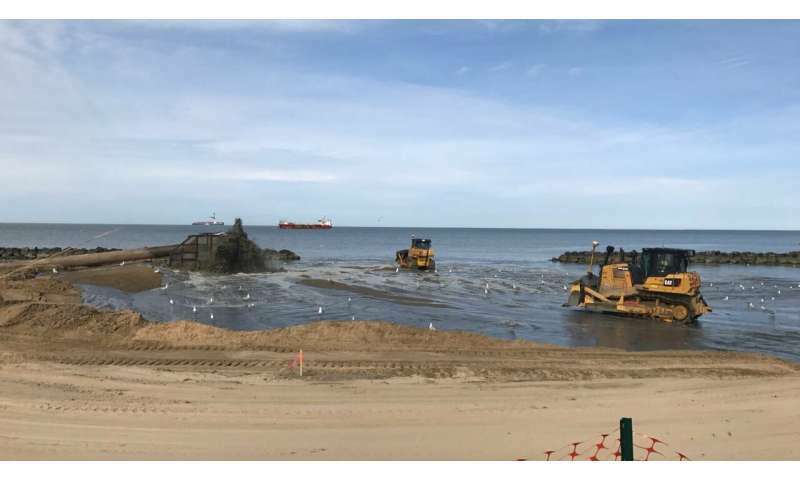 Beach nourishment, or the importing of sand to buffer shorelines from storms and build up beaches for tourism, became the predominant form of coastal protection in the U.S. in the 1960s, according to reports from the U.S. National Research Council. Using the locations and volumes of nourishment projects in the database, the authors compared these records to rates of shoreline change and coastal population density. The study's authors found compelling evidence to suggest beach nourishment may be masking the true measure of erosion along the U.S. Atlantic Coast. Beach nourishment does not occur everywhere. Natural and sparsely developed reaches of coast may still show signs of significant erosion, according to the study. Furthermore, "Sea level rise doesn't automatically mean that you're going to see shoreline erosion everywhere," Lazarus said. Other processes factor in, such as the redistribution of sediment alongshore by waves. But where beach nourishment does happen, waves may push the imported sand up or down the coast, spreading the effects of nourishment alongshore, even to coastal areas where humans didn't directly add sand.That means even coastal areas without beach nourishment could benefit from sand being added to a beach nearby. Lazarus notes that while these beach nourishment projects along the U.S. Atlantic Coast were undertaken at a local level, they all add up to an incredible feat of humans reshaping the natural landscape across a very large spatial scale. He calls it a "geomorphic example of geo-engineering." "It's an absolutely massive intervention if you look at it all together," he said, adding that humans move around more earth materials than all geomorphic processes combined. "We are an agent of geomorphic change just the way you would think about rivers or glaciers or wind or waves." While beach nourishment may be appearing to keep sea level rise at bay, Lazarus believes some communities won't be able to continue at the current pace. "Sand is getting less and less easy to come by," he said. 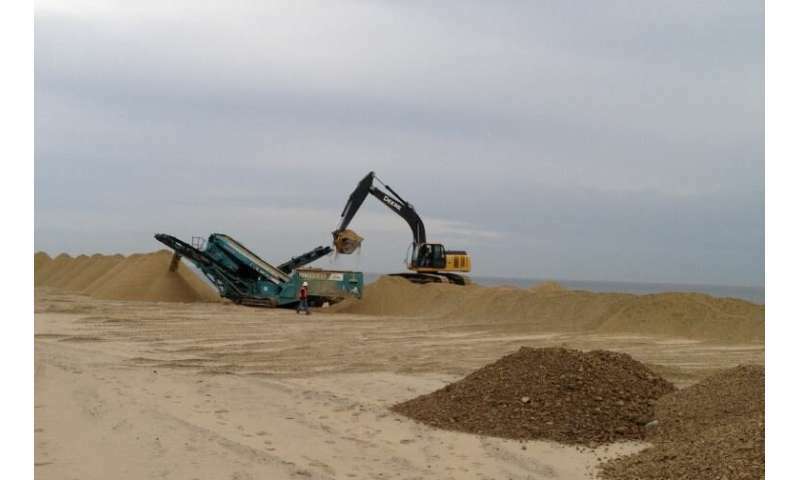 "The cost of these beach nourishment projects keeps going up." Local communities that rely on tourism to support their economies may suffer in the future if they can't afford to import sand, Lazarus said. "As that sand availability dwindles, these coastal towns are going to be in real straits," he said, predicting a gap will develop between wealthier beach communities and those with less means. To shore up beaches, just add sand? I can tell you this from experience, the beach at Virginia Beach, Virginia is massively wider now than it was back in the 1970s.